The use of QPay ePOS augments the efforts of retail stores who want to increase their revenue and customer experience. The development of QPay ePOS has answered the needs of the merchants to meet these criteria. Does away with the waiting time for POS machines. ePOS is just an Android app that can be downloaded to any Android device. QPay ePOS comes with a customer app which customers can use to make payments 24* 7. QPay ePOS provides multiple payment options in one app. Apart from Credit and Debit card, it also includes UPI. Simply put, QPay ePOS provides payment options for all types of customers: those with and without cards effectively catering for customers in rural areas who only have banks accounts. QPay ePOS can be used for Card present and Card not present transactions. Safe and secure – no risk of Card cloning as the transaction is handled in a PCI certified environment. This is no surprise. With the use of Smartphones where the Android App can be installed, makes it easier for merchants to facilitate the waiting lists, speed up transactions, and serve customers quickly. Thus, it makes the business and the customers happy. With its mobility, sales clerks or managers can now have the freedom to roam around the store, check prices, greet and serve customers etc. It is something that cannot be done using the traditional POS. This way, customers will have a better in-store experience. The simplicity of smart phones reduces the effort to wrestle with the outdated POS systems. Since QPay ePOS product is simple to use, any employee can learn to complete a transaction in a couple of minutes. Thus, training is significantly easier to execute without stretching the budget. No monthly rental charges as in the case of a traditional POS terminal. QPay ePOS is simple to set up. You will get professional assistance from QPay. Arming store associates and managers with Smartphones downloaded with QPay ePOS helps retailers improve customer service and increase shopper engagement leading to boost in brick-and mortar sales. QPay ePOS will give way for establishments to also do up-sell and cross-sell, which can help move costly inventory items, increase turnover and ultimately boost your revenue. Notably, people today are opting ease, flexibility and convenience. And, QPay ePOS could be the best option for merchants looking to meet the evolving demands of their mobility-driven customers ,while shedding the costs and constraints of pricey, obsolete infrastructure. HOW DOES QPay ePOS APPLICATION WORK? Step 1: You need an Android Device with Internet connection. 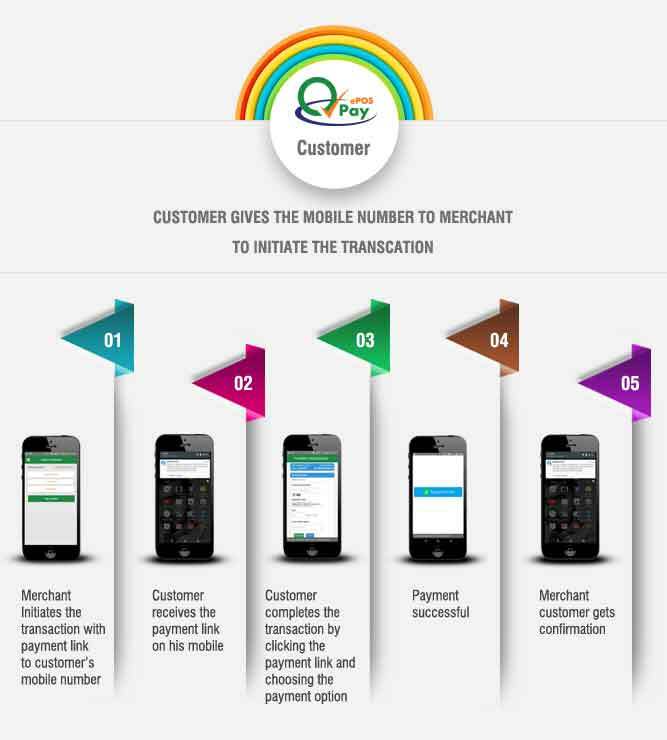 Step 2: Download our QPay ePOS Application via our website (www.qpayindia.com) or Playstore and register as Merchant. Once registered, our executive will contact you to verify & collect the KYC documents. Step 3: On submission of necessary KYC documents, we will activate your account in few minutes. Step 4: You are now ready to accept payments from your customers immediately. You register the customer the first time on the mobile application. Thereafter, you enter the customer's mobile number, amount to receive and any reference for the payment in the app. You then send an SMS/Whatsapp text to the customer's given mobile number with the payment Link from the mobile app. The customer receives the SMS/Whatsapp text sent to his mobile with the payment Link. The customer clicks on the payment link and completes the payment by selecting from the various modes of payment i.e Credit Card, Debit Card , UPI etc. QPay receives the Payment transaction in its Gateway and processes the payment based on the type of transaction selected. When the payment has been processed SMS notifications are sent to both, the customer and the Merchant that payment has been authorised and processed with the Reference id. This process is almost instant. The QPay Back office then takes over the monitoring of the authorised transaction and transfers the amount collected to the Merchant accounts as agreed. The merchants can see the status of their account through a dashboard in the app and can also login to their account to check the details of their transactions, settlements and other information. QPay has always been looking for ways to achieve its goal of providing easy and affordable way for merchants to sell online while also looking for opportunities to serve the community. Demonetisation in 2016 changed the dynamics suddenly for the customers and as well retailers, in particular, who wanted to reach out to their customers to ease sales. QPay have come up with a solution to remedy this situation with its QPay ePOS product. The solution addresses all the issues for the retailers and their customers and additionally improves upon the traditional POS system in the market. WHAT is QPay ePOS ? 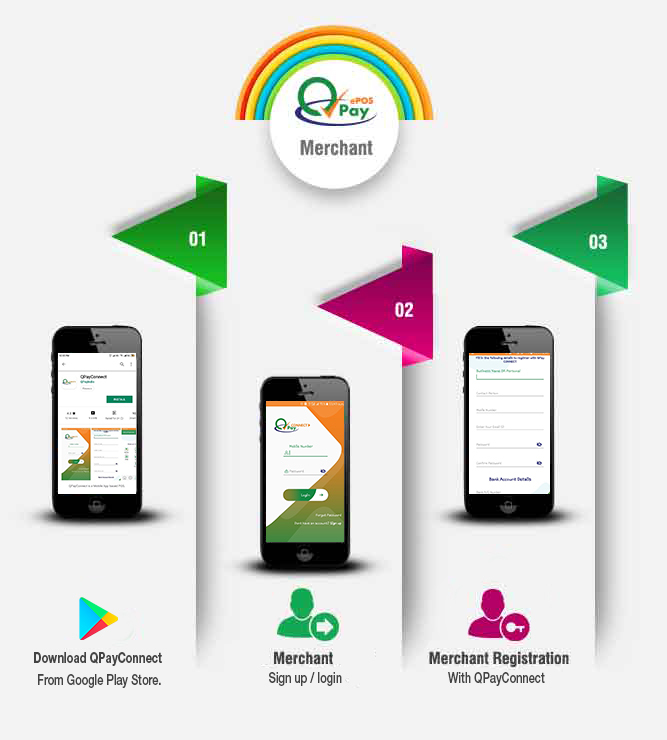 QPay ePOS product is an Android Application especially built for small Merchants/retailers who do not have a website of their own nor any means to accept electronic payments for the goods or services they offer. Please feel free to send in your enquiries & we would get back to you at the earliest! You can easily connect to the QPay Payment Gateway, which provides complex infrastructure and security necessary to ensure secure, fast and reliable transactions. 23/12, 5th Main Road, Kasturba Nagar, Adyar, Chennai 600 020, TamilNadu, India.